It’s my second Twirthday! 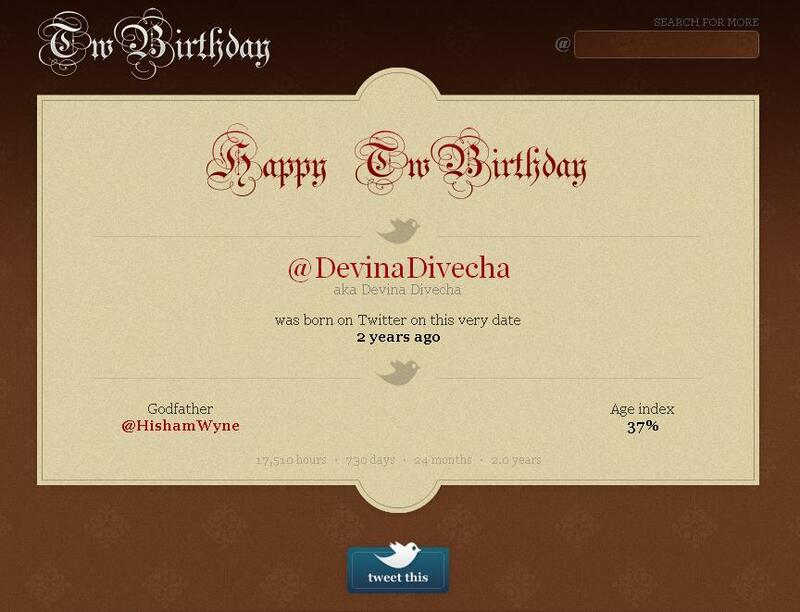 And @HishamWyne is my godfather. I got a tweet at midnight from @TwBirthday saying:”@DevinaDivecha Happy 2nd TwBirthday! You’ve been around since 24 July 2009! http://twbirthday.com/DevinaDivecha/“. I clicked on the link and couldn’t stop laughing because it said Hisham (@HishamWyne) is my godfather. I chuckled as I remembered him being the first person I followed on Twitter. Memories flooded as I remembered what prompted me, two years ago, to register for an account with Twitter. Oddly and possibly embarrassingly enough, it started with American Idol. And also with Time Out Dubai. How do the two merge? I was a fan of the show when Simon Cowell was sniping at the contestants, when Paula Abdul was always nice, and Randy Jackson could out-dawg anyone in the world. And I loved knowing backstage information, so when I found out host Ryan Seacrest was using something called Twitter to spread information about the show and other celeb news, I started checking his Twitter profile. When I was lucky enough to land an internship with Time Out Dubai in the summer of 2009 for almost three months, I was ecstatic. Among other things, I was working on the Time In page, and also giving them news about things happening around Dubai and tweets as well. Twitter was a godsend during those months, I tell ya. After a few weeks of looking at Ryan Seacrest’s profile and noticing someone called Alexander McNabb, I decided to sign up. And gave away my godfather spot to Hisham Wyne. After that it was a whirlwind ride. I got into the spirit of tweeting, and finding out about Dubai events and interesting people I would have never met otherwise. I found out about the first GeekFest Dubai through Twitter, attended it and did a short write-up about it for Time Out Dubai. First person I met there was Mita Srinivasan (@mita56). I almost attended a tweetup at Bert’s Cafe, Greens, organized by Akanksha Goel, only to not go because it was far too close to my departure date to the UK and I had too much to do. I groaned and moaned when I missed all the GeekFests after that. I found out about the wonderful TwitBookClub, hosted by Nathan Fillion-nut Anastasia (@TDAllonsy) and attended their meetings in spirit. When I was lonely in Sheffield on cold nights, I’d tune in to the student radio @CampusRadioME founded by Muhammed Ali Jamadar (@MaliZomg) and Ritesh Jeswani (@whitecrayon) and dedicated songs to people I loved and people I didn’t. I attended tweetups in my vacations, organized by @chiragnd, had epiphanies in front of @NikhilSoneja and inspite of meeting Rami (@cubex) far too many times, have always had him ask me who I am. I’ve had random arguments with Rupert Bumfrey (@rupertbu) about how I love Sheffield and he thinks it’s a bit meh, as kids these days say. I met complete stangers in UK off Twitter – it included taking a train to Manchester to meet Khadijah Rawat (@RawatCentral), and standing buffered up in the cold outside the journalism department in Sheffield to greet @eddydubai emerging from a black cab, only then to take a train a few weeks later to where he lived to get into his car, hoping against hope he wasn’t a deranged lunatic fattening me up (quite literally; we ate a lot that day) for the kill. And when I came back to Dubai, I threw myself into the Twitterati world like I never could before. I was given a chance to speak at the Dubai Twestival by PK Gulati (@pkgulati), attended @DaddyBird‘s and @kangayayaroo‘s Dubai farewell, and only yesterday, met new-to-Twitter tweeps Tanya (@tanyatourani) and Karan (@kdoggydogg) who have asked me (ME!) for advice on getting more active on the Dubai Twitter scene. The people, or rather, tweeps, I’ve mentioned above are just a small snippet of the life, the freedom and the mingling of cultures that Twitter has given me. And for that, I shall remain eternally grateful. Note: If you’re not mentioned here, I can only apologize…every one I follow has given me something to treasure. I love you all.